Experience the film that captured the hearts of critics and fans around the world in a breathtaking new way. 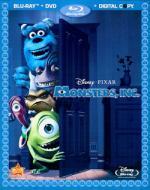 Monsters, Inc. is "visually dazzling, action-packed and hilarious," raves the Boston Herald. 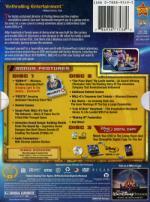 And now, with eye-popping, crystal-clear visuals and theater-quality sound, it's even better on Disney Blu-ray Hi-Def! Open the door to a fantastic world of fun and imagination that will have you screaming for more. Featuring never-before-seen bonus features, including Roz's 100-Door Challenge Game, the original DVD and a DisneyFile Digital Copy of the movie, Monsters, Inc. is a sensational new experience on Disney Blu-ray. I loved this movie when I first saw it in the theater when it originally came out and I still love it now. Like I mentioned in another thread here, I decided to get the Blu-ray version even though I have the DVD. I decided to watch the movie again on Blu-ray. Holy crap is it amazing on Blu-ray. The colors are so bright and vibrant that the characters really pop. I was amazed by Sully's hair the first time I saw the movie. I still sometimes compare newer computer animated movies to this. The magnificence of his hair has been my high standard for years. It looks even better on Blu-ray, something I wasn't sure was possible. It is freaking awesome how good this movie looks. I noticed all sorts of details, like the grain in the wood on doors and furniture, the little blood vessels in Mike's eye, the skin tones of the various monsters with all the subtle colors and shadows, that I never noticed before. I think the whole idea of a monster world is cool and appealing, especially to children. In their childhood, everyone probably thought at least once that there was a monster under the bed or in the closet. I love the idea that monsters are terrified of children and use screams for their power. That works as an interesting story even without everything with Boo and Sully. That part does add the heart to the story though and it would have been a weaker movie without out. Several of the extras on the Blu-ray are the same ones that were on the DVD. One thing that really stood out to me watching them this time is the importance Pete Doctor - the director - and the others at Pixar put on story. I am almost positive that they said something like that on the extras for Up as well. Someone, I think Pete Doctor, even said in one of the that it doesn't matter how amazing they make the movies look if the story doesn't work. It is too bad that more directors don't feel that way. + a few for how freaking awesome everything in the movie looks on Blu-ray. I did post a review on Epinions back after I first saw the movie in theaters. I did update it once to add DVD information and I've added links to other Pixar movie reviews. Now I may work on an update for the Blu-ray version. Anyway, here's the link. On the Up Blu-Ray they talk about the multiple endings they tried and the way the opening scene could have been slightly different and it just shows how important the story is. They put more work into the story than anything else. I still remember a quote years ago from John Lasseter when he showed his short about the bee to studio executives, to demonstrate 3D animation. Remember this is when Disney was suffering and about to close the animation studios all together. One of the executives was amazed and asked John what software he used. He tried to explain and the guy was confused. He wanted to know what software did the story because it was so funny! Or something like that. He wanted to know what software did the story because it was so funny! Or something like that. Jon I remember this from when I watched The Pixar Story. It was a while ago but I remember that it was when they premiered their first short film, The Adventures of Andre and Wally B at a huge computer/graphics convention called SIGGRAPH. It was there that they recieved the questions on how they added so much humour into it. From what I can remember from the documentary the audience were almost overwhelmed that these characters and this funny story was created in computers. Haha, have you seen The Pixar Story? If you haven't try and see it as fast as you can. It's one of my favourite documentaries that I've seen. A fantastic look at the history of computer animation from it's very beginning and how it influenced modern media. I have only had one full viewing of it but I really want to watch it again, I'm hoping to get it somehow. I think it's on the special features of WALL-E blu-ray. Yeah, it's on WALL-E. Never watched it properly, but I'm sure I'd heard that anecdote way before 2007 when it was made, so I must have seen something similar. If the above is the trailer for that documentary then it seems I haven't watched it yet either. A mistake I must correct very quickly! BTW, anyone know of the Jim Henson Story (or whatever the actual title is) is available on DVD somehow...? I think there was a little part of The Pixar Story on my Up Blu-ray...I'll have to go look later and check for sure. I'll have to track this documentary down and watch all of it. I'm glad I brought this doco up for you both, it's fantastic! I recommend any fan of Pixar, or just animated films in general to definitely watch it. I definitely want to see it. Is the whole thing on the WALL-E Blu-ray? That will just be that much more motivation to get that one on Blu. I looked last night..the whole documentary is on the WALL-E DVD I have. So I'll be watching that here soon I think. It is on the second disc. Here's the DVD version I have. 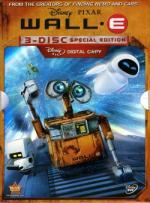 By the way...my finding that it is on the DVD I have doesn't mean I won't get the Blu-ray of WALL-E eventually. I think it is just a matter of time before I get it. I can't seem to resist Pixar on Blu. I have WALL-E on normal DVD as well, but mine doesn't have the documentary, it's just the movie pretty much, I ended up with a crappy single disc version. I will have to get it on blu-ray now . Also I'm glad you found that documentary, as I said before, it's fantastic I would love to hear your thoughts on it, or even a review after you watch it. Well see, that is a perfectly good reason to get it on Blu-ray. I probably will post something after I watch it. And straight to my wish list it went.